Outdoor events can be done in so many ways, it can leave one wondering where to start. A great first step is deciding what kind of atmosphere you want your event to have. That gives you somewhere to start in terms of design and décor. No matter what design you settle on, there’s a way you can turn it into an outdoor event and there is a tent that can make your event really capture the attention of your guests. Here are some things tents can do that will compliment your event atmosphere! Outdoor events have an advantage with lighting. Light travels well in the open spaces and can give your event a really great ambiance that you just wouldn’t get indoors. The possibilities for outdoor lighting are so varied, there are a lot of routes you can take. Picture this: a large outdoor tent, open to the outside and strung with fairy lights. The small lights give the whole scene a delicate look while also putting off sufficient lighting. This is great for weddings or other classy, formal affairs. You can also use things like lanterns if you’re going for a more rustic theme. No matter what light source you decide on, the benefit of using them outside is that it opens the space up. Lighting indoors is said to make things feel bigger, but it actually can do a better job of making it feel small when you can see all of the confining walls so clearly. 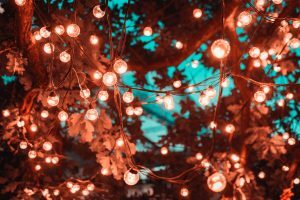 Lighting outdoors during the hours of dusk or after the sun has set will contrast the darkness surrounding the event area and really accentuate how much space there is which leaves guests feeling free and unconfined. Playing music through a stereo or hiring someone to perform for your event are both perfectly valid options depending on the budget you have and the purpose of the music. What do both of those have in common when being displayed outdoors? They can both be amplified with speakers the same way without the feeling that there’s no escaping the noise. One of the downsides to music in indoor areas is that it can sometimes feel like the noise is filling the entire event space with no escape. People will often go outside to get into the fresh air and away from the noise. This isn’t an issue when your event is already outside. Whatever speakers you have to work with can be set up around the main event area. Then people will be free to move closer or further away as they please, remaining part of the event. And lastly, outdoor events using tents to host gives you that access to nature that you just can’t get from indoors. Varsity Tents offers a selection of heaters and air conditioners to keep the temperature stable even while outside. With those and the cover from weather, tents allow your guests to enjoy fresh air and nature views nearby.